This is a dream come true! 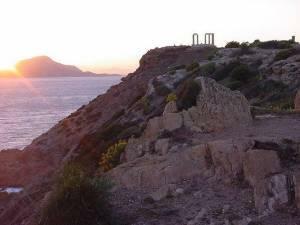 In just four days, you’ll see dramatic Cape Sounion and the Temple of Poseidon, usually visited at Sunset. The following day you'll have an opportunity to sail to the three beautiful island destinations of Aegina, Poros, and Hydra, with lunch on board. Next up is a scenic drive to ancient Delphi, with a thorough tour of the site. Finally, of course, no visit would be complete without a guided tour of the best of Athens City, including the Acropolis and the New Acropolis Museum. This itinerary presumes an early arrival flight on Day 1, and a late departure flight on Day 4. Arrival morning before noon at Athens International Airport and transfer to your Hotel. Early afternoon, depart for a drive along the beautiful Attika coast to Cape Sounion, the most southerly point on the mainland, for a guided visit of the Poseidon Temple, standing majestically on the cliff, overlooking the Aegean Sea. Return to the hotel late in the evening. Overnight Athens. In the morning, transfer to the port of Trocadero for the One-Day-Cruise to the Saronic Islands of Aegina, Poros and Hydra. Each of these islands has its own charming atmosphere. Aegina, known for its neoclassical buildings and its busy harbor; Poros, a green island, with many sandy beaches and its famous lemon forest; and finally Hydra, the island for artists, with narrow, whitewashed streets, an island for pedestrians only, as no motorized vehicles are allowed here. There will be plenty of time for explorations at each port-of-call. Lunch will be served on board. Return to your hotel in the evening. Overnight Athens. Depart in the morning for a drive along the National road, via Thive and Livadia, to Delphi. We will visit the famous site, the “Navel of the World,” where the outcome of events and history was ‘predicted’ for many warriors and politicians by the renowned oracle, Pythia, in ancient times. The museum contains many important finds from the site, among them the impressive Bronze Charioteer. Lunch at a local restaurant followed by a drive to Arachova for shopping. Return to Athens in the evening. Overnight Athens. In the morning, depart for an orientation tour of Athens with our professional guide, passing by the most important ancient and modern monuments of town. Stop at the foot of the Acropolis hill for an extensive visit of the site, as well as the New Acropolis Museum. Transfer to the airport to connect to your evening flight. *All tours are operated by a Tour Organizing Company.